The Christmas songs are now on the radio and we are well into December, Christmas is just around the corner. By now, your Christmas shopping is probably underway but you have no idea what to get your snowboarder friends or family. Don’t worry, we have put together a fantastic Christmas gift guide for snowboarders to help you get the last few stocking fillers or bits for under the tree. The snow is currently falling across Europe and I’m sure your snowboarder has booked their next trip away, so why not get them even more excited on about riding this winter with a brand new snowboard. What better present can you get a snowboarder than a new snowboard to make their Christmas? The Flight Attendant is the ideal Christmas present for someone who gets up first thing in the morning, in the hunt for fresh tracks. The board is aggressively precise, yet still has an easy riding feel to it. The setback camber combined with its sidecut gives the board a playful, twin freestyle feel, whilst the entry rocker and taper adds float and flow, for the deep powder days. The Carbon I-Beam gives the board pop and flex, while the Dualzone EGD keeps it steady on the ice and hardpack. One of the most talked about boards of 2016/17, the Salomon Rumble Fish is a must have this Christmas. Brand new this year, all terrain women specific board, is already ahead of its class. With a medium flex, true twin camber, this board is designed for ladies who are out there riding the lines they want and having fun doing it. The smooth riding board allows the rider to drift at slow speeds, yet it can hold a hard line when needed to. Snowboard boots are the most customisable piece of any snowboarders’ kit. It could be said, they are also the most important piece of their kit. 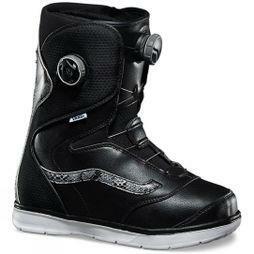 Fit correctly snowboard boots can add comfort and precision to their riding. Whether it is their first boot or replacing an old pair, you can be sure that this present will continue to put a smile on their face long after Christmas day. The ultimate, all mountain freestyle boot, the Vans Aura, offers a supportive medium flex with a dual boa system. By using the dual boa for separate upper and lower zone tightening, along with a custom slide guide, your snowboarder will be able to customise these boots to find a perfect fit. Making this a fantastic Christmas gift for someone who struggles to find a good fitting boot. Heal lift is a thing of the past with Vans dual density, heat mouldable liner, that not only holds the foot but also adds a superior comfort to the boot. This boot is great for an all mountain rider, who shreds from the park to the backcountry. Whether your snowboarder is looking to progress quickly, or is an advanced rider that prefers medium, even flexing boots, the Salomon Ivy is the perfect gift for this Christmas. Revamped for 2016/17, the Salomon Ivy is lighter and easier to alter than before. The new ZoneLock lacing system can be easily adjusted with gloves on, for the ultimate heel-hold on the go, whilst the Flight Outsole offers a lightweight, cushioned sole to help dampen vibrations and impacts. The Ivy will let your snowboarder drive those turns all over the mountain, push out presses and send big lines with style. Snowboard bindings are an integral part of a snowboarders set up. It is what connects them to their board, it transfers every movement through to the board. A good binding will enhance the natural flex pattern and provide all day comfort adding to their riding experience, so why not treat them to a new pair of bindings this Christmas. One of the most comfortable bindings on the market, the Burton Genesis is a must have on everyone’s Christmas list. Designed to be the most comfortable binding ever, Burton Genesis is a blended experience of comfort and performance. The overall riding experience is smoothened and cushioned with a softer flex and a combination of anatomical elements, whilst the latest innovations in hi-back and strap design, wraps and cradles the boot in complete suspension. Although the bindings are extremely comfortable, they have the power and rigidity, to stands up to whatever conditions or terrain you throw at them, making them a fantastic all mountain binding, that will keep your snowboarder going all day. As one of our bestselling Women’s bindings, the Union Milan is sure to make someone’s Christmas. By combining a medium flex, with a women’s specific design, the Milan provides all day comfort all over the mountain. The 3D shaped straps securely wrap the boot and the large EVA bushing underneath the binding damps out vibrations, keeping the ride smooth and supple. Designed especially for the ladies – the Milan is a softer flexing, anatomically correct binding that provides incredible comfort all season long. Compatible with snowboard with both standard 4x2 hole mounting patterns and The Channel from Burton, you can’t go wrong with these as a gift. Helmets are becoming increasingly more popular, not just for safety but also for fashion. We here at snow + Rock have a great range of helmets to keep your loved ones safe, whilst looking good. Moulded into the worlds lightest certified snow helmet, The Maze is the perfect Christmas gift to keep your snowboarder safe. The lightweight mould construction fuses a polycarbonated shell to an EPS cap directly in the mould to improve shock absorbency and increase safety. The modern, clean and minimalistic design helmet is the go-to helmet for snowboards that value both safety and style. 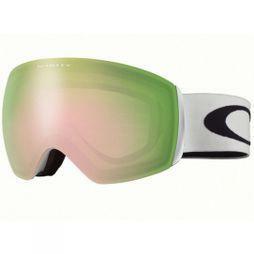 Goggles are an important part of any mountain goers kit, they help to protect your eyes from harmful, unseen UV light. Guaranteeing 100% UVA and UVB protect, our goggle range has a variety of styles, shapes and colours to find the right pair of goggles for your Christmas gift this year. Pro snowboarder Bode Merrill's signature goggles keeps focus on the slopes, by allowing clear vision in any weather condition. The combination of style and technology makes these goggles a must have for this Christmas. A range of innovative technologies built in to these goggle, provides the next level of protection with ease and simplicity. Thanks to Magna-Tech, lens changing is quick and easy, by simply grabbing and pulling the lens from the frame. In addition, the MFI (Magnetic Facemask Integration) Technology allows the included Anon Facemask to be attached to the base of the goggle by magnets. Oakleys new Flight Deck Goggle was inspired by fighter pilots’ visors. The XM Series is designed for riders with slightly smaller faces, making it ideal for a woman’s Christmas present. With an alteration to the frame size, peripheral and downwards vision has been increased, allowing more line of sight to avoid obstacles when shredding down the mountain. The lightweight, rimless frame has a wide range of helmet compatibility, meaning you can’t go wrong with these as a Christmas gift. A pair of Stance snowboard socks is the best stocking filler your snowboarder will receive. Made from the finest Merino Wool, this all natural blend provides thermo regulation, quick-drying, and superior moisture wicking. Wool has natural anti-microbial properties benefiting your fresh feet. Breathable mesh has been fitted into strategic areas to improve ventilation and elevate comfort. The cushioning design has air channels to keep them cool and comfortable while giving you protection from wear and tear on the most extreme adventures. Reinforced arch construction built to give them correct support and eliminate foot fatigue and fully wrapped terry loop toe box keep their toes toasty. It’s that magical time of year; the jingle bells are jingling; Christmas is on its way. To help make your Christmas shopping as quick and easy as possible, we have created a list of Christmas gifts for climbers. So whether you are after a stocking filler or something for under the Christmas tree, we have some fantastic gifts for you to look at.